Traditionally, an acorn symbol was used as a sign for strength. Wise women or “witches” drew the acorn symbol when working to build the health of an ill person. European settlers in America used the acorn symbol in the 17th and 18th centuries on buildings and furniture. Many of these settlers had strong religious beliefs, but still used the acorn symbol to assure continued good luck and good fortune. From early times, women have carried acorns to symbolize fertility. The acorn nut symbolized the phallus and the cup symbolized the womb. Since becoming pregnant was, sometimes, the only way a woman could prove that she deserved to be married to an important man, such as a king, carrying an acorn seems a small price to pay. You’ve probably heard the saying that “from little acorns, mighty oak trees grow.” It takes a long time for that little acorn to make more acorns as oak trees are usually 20 years old before they produce an acorn crop. Squirrels and many other animals hunt acorns in the fall to store them for their winter food supply. Native Americans and early European settlers in America used acorns as a source of food. For many Native Americans, acorns were a staple food that was key to their survival during the winter. It was made into everything from soup to bread. Oak trees and acorns have benefited people for a long time. To make your acorn tea special, you can use teapots and tea infusers made in an acorn shape. Make or buy acorn flour. If it isn’t roasted, roast the flour on a cookie sheet at 325 degrees until the flour is dark brown, about 15-20 minutes. Place 1 tablespoon of roasted acorn flour per cup of tea in your tea pot or infuser. Pour boiling water over the roasted acorn flour. Let the acorn tea steep for 5-10 minutes. Pour the acorn tea in your favorite cup and enjoy! 1. Acorns and Eat’em: A How To Acorn Cookbook covers everything from cookies to cheesecake to enchiladas and more. 2. It Will Live Forever: Traditional Yosemite Indian Acorn Preparation explains how acorns are gathered, prepared so that they are safe to eat, cooked and eaten. If an acorn has shown up in your tea leaves, it’s a wonderful sign. If you are starting a project, remember that it doesn’t matter how small the project is (the little acorn), the project and success will grow (the mighty oak tree). 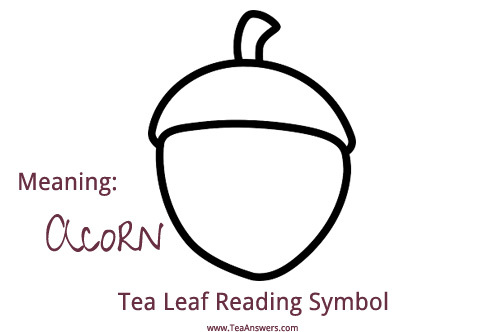 If you are concerned about your health, the acorn symbol in your tea leaves is a symbol for improved or continued good health, as well as continued strength. IF you are starting a new business or project, the acorn symbol in your tea leaves is a symbol for good luck and good fortune.